Edited 3 times, last by Bartek ( Jul 3rd 2014 ). My team Galatasaray is ina hard group..There are strong teams like Spartak and Halcon..But we have good players like Slywia Fowles , Semione Augustus(US NT Players) , Marrie Cample(She will play with Turkish citizien )she was the best scorer of the Turksih League, Gintare Petroneyte (Last year's Euro Cup Champion's best scorer) and some of Turkish NT players( Işıl,Tuğba,Bahar Çağlar,..)..I hope we will play in F4... Turkish Basketball Fans are waiting good achievement from Galatasaray Medical Park and Fenerbahce!! I think Fenerbahce yes but Galatasaray - there is no way. UMMC Ekaterinburg will be in Final at least Spartak Moscow Region maybe give Us suprise and will be in Final but I don't think so. Maybe two Turkish Teams will meet in semi final and one of it will be in FINAL!! UMMC is a great team..They are one of the biggest favourite of this tournament..!! Let's see..Time will show us! 18 October - SuperCup of Europe - Spartak Moscow Region (Europe Champion) - Sony Athinaikos (EuroCup Champion). Yesterday started Russian Premier League. UMMC Ekaterinburg, one of Favourites Champions League, crushed Spartak Noginsk 83-28 ! One thing is absolutely certain this season, none of us have to wait until the knockout stages of EuroLeague Women this year for a true All Star feast since Group B throws up one of the most eagerly anticipated match-ups in the Qualifying Round for many years. Russian giants and perennial Final Four participants UMMC Ekaterinburg are penciled in to go up against their nemesis Diana Taurasi who is now at the team who have been the talk of the off-season - namely the hugely ambitious Turkish club Fenerbahce SK. If there is one team that has dominated EuroLeague Women chatter during the summer months then surely it is Fenerbahce. They have managed to scoop what is probably the biggest ELW signing in recent years after luring arguably the biggest star of the tournament to Istanbul with Taurasi now tasked to bite the hand that used to feed her by helping the Turkish team break the dominance of Spartak Moscow Region. The arrival of Taurasi is of course huge and from her personal perspective, it offers her a fresh challenge and it will be fascinating to see how she responds. The added dimension of course being that it was Taurasi who was the main reason for the Final Four dreams of Fenerbahce being shattered last season. Remember her 38 point performance in that memorable 87-85 overtime win? She will have a familiar face or two in the locker room after Fenerbahce made what looks to be a really shrewd decision to bring Laszlo Ratgeber back into ELW by handing him the coaching reins. He has a vast amount of experience and knows what it's like to work with Taurasi and above anything else, he understands and has knowledge of how to get to the top of the ELW podium. For me, it was a shame when he left Spartak after one season at the helm - even if it was for a talented coach in Pokey Chatman. We should all now be thankful one of the top characters in the Womens game is back and with another top coaching position to boot! Of course this season is not all about Diana Taurasi - far from it. Fenerbahce made it to the last eight last season and already had a core of players capable while DT is only one of a number of top class summer arrivals. There is a really nice look about the Fenerbahce roster this year with added strength in depth provided by Anna Vajda, Hana Horakova and Ivana Matovic who have all been drafted in by the club. The qualities of this trio are immense with Vajda having been ruled out of summer action with Hungary due to injury but once she is firing on all cylinders, she will be a big threat. Similarly Matovic is one of the most consistent top level performers in the competition and her arrival from Lotos Gdynia could just be one of the signings of the summer. I feel Matovic doesn't always get the respect her track record deserves and she would be a worthy recipient of any silverware which the club may acquire moving forward. Horakova meanwhile is another really solid and talented player and as an added bonus she is probably in the best form of her career - as evidenced by her silver medal at the recent FIBA World Championship. She will add a wealth of experience which will be useful on the floor but also around the club while boosting the talent in the backcourt. When you consider the sheer quality of those new players pulling on a Fenerbahce vest for the first time, you realise all of the summer talk about the club's potential is well placed since the quartet are going to be playing alongside some top level players who are already at the club from last year. Another familiar face for Taurasi will be Phoenix Mercury team-mate Penelope Taylor who averaged over 15 points per game last season while further power in the paint is provided by one of my favourite players around Europe - Turkish star Nevriye Yilmaz. She also posted over 15 points per game and is a class act while the club is also lucky to have Nevin Nevlin who may well be pushed down the pecking order but will still remain a key component for the team. By adding Vajda and Matovic to that pool of frontcourt players it makes it an awesome prospect and it becomes abundantly clear why the club do have potential to go all of the way. Of course we must not forget the Turkish players and especially the guard duo of Birsel Vardarli and Esmeral Tuncluer. The former in particular will be hugely important in pulling the strings and she showed last year how important she is with 59 assists. In summary, the excited buzz surrounding the club is to be expected. On paper they have the roster and coach to reach the ELW podium. However both you and me know, basketball isn't played on paper. Pressure and expectation can weigh heavy and with such stellar names at his disposal, Ratgeber probably won't get any time or breathing space if things don't go exactly to plan. Consequently it's going to be terrific following their progress this year as the amiable play-caller tries to take the club to the new territory of Final Four. EuroLeague Women 2010 - Finished second in Group D (7-3) behind Spartak Moscow Region who returned to beat the club in the last eight of the competition. Star Choice - Diana Taurasi and I don't think there is much point in explaining why. Take a book of superlatives that could be used to describe a talented player at the very top of her profession and insert most of them in this space. Rising Star - Even more than the arrival of Taurasi, I am just as thrilled and excited that a young player like Ozge Kavurmacioglu is being talked about as being part of the team this year. I first came across the all-action small forward at the U16 European Championship Women in Naples during 2009 when she excelled and her performances during the summer of this year have been even more magnificent. She posted 14 points and 8 rebounds per game at the FIBA U17 World Championship Women and then achieved a scintillating tournament double-double of 17 points and 11 rebounds at the U18 European Championship Women. While she is not likely to see much court time, I feel even just being around these type of top level players is fantastic for her development. The best thing I can say about Ozge is that you feel she is the kind of hard-nosed player even at the age of 17 who doesn't need to be treated with ‘kid gloves'. Ratgeber could throw her on for a few minutes and know she won't feel overawed by the situation. Write down her name now folks. I think she could be a huge star of the future. Did You Know? -. Fenerbahce gave up more points per game last season than any of the other teams who made it to the last eight of the competition. That was probably due to the fact that they gave up far too many triples since. "The runaway favorite to win the EuroLeague can't be any other team but four-time champions Spartak Moscow. Of course, our goal is to make the Final Four, a place where Fener has never been before. Signing Diana Taurasi is a sensational move." Note - Yes, Diana Taurasi is the marquee player of any team, no matter how ram-packed it is with other quality players. For me, the reason she was able to be so influential and lead Spartak to such unprecedented glory was not just because of her talent but the way the other players filled their roles. Whether she did or didn't perform, players like Syl Fowles and Janel McCarville were always doing the hard work and posting rock solid numbers even if they didn't always get the credit they deserved. Now the onus is on the likes of Vajda, Yilmaz and Matovic to do the same. I will also be watching closely to compare the respective court-time, shots taken and influence of Taurasi compared to her time in Moscow but also how it compares in the context of her team-mates. As with the case at Spartak, this will be no one-woman show. "Lo sbaglio più grande e quello di credere di aver vinto prima ancora di giocare la partita"
Oh goodness, what can I say about this incredible list of bona-fide superstars that you don't already know? Very little I suspect. They play all year in EuroLeague Women knowing unless they are subjected to a real giant killing along the way, their fate and continued quest for glory is going to come down to one weekend during Spring. 2011 doesn't look like it will be any different and this monumental and now epic desire to finally land that coveted title shows few signs of slowing down. They most certainly have the seven year itch after last winning the title in 2003. The fact that rivals Spartak Moscow Region have won four in a row is like the knife of disappointment is being twisted deep into the stomach but one day very soon, Ekat's time will come. With so much talent at their disposal it simply has to - surely. It's hard to know where to start even assessing a team like Ekat and perhaps for those of you reading this, a simple reminder of the talent they have is sufficient to underline just why they are always knocking on the door. How would you like to have a line-up of talent including Celine Dumerc, Cappie Pondexter, Deanna Nolan, Agnieszka Bibrzycka, Svetlana Abrosimova, Olga Arteshina, Crystal Langhorne, Ann Wauters, Maria Stepanova and Sandrine Gruda? This who is who of Womens basketball doesn't even end there. It looks like Candace Parker will also be back in town for the business end of the season early in 2011. So, if they are knocking on the door, why have they not entered and collected the EuroLeague Women title during recent years? The simple and most obvious answer remains that they have been outplayed in those critical big games and have just not hit peak form when it really matters, in most cases individually and most definitely collectively. It's not like they have failed spectacularly, they just haven't had that edge when they have needed it. With the passing of each failed Final Four comes an even more driven season the following year. It is becoming an obsession for everyone associated with the club - seeing those Spartak players wearing those ‘Four In A Row' t-shirts can't have been easy to take. Once again they should storm to the last four of the competition. This year they will of course also get some added practice of locking down Diana Taurasi in the group stages now she is at Fenerbahce and of course assessing the threat the Turkish side pose. Coach Vetra has the tools for the job although in reality, he has probably always had them. The big difference is that this year Ekat have not moved a muscle in terms of the make-up of their team while their rivals will have to deal with chemistry and gelling issues for the early part of the season. He will surely get one more crack at coming up with a strategy for his star-studded team to prevail over their rivals when it comes to Final Four next year. Motivation won't be a problem since the title is all that matters to an ELW superpower like Ekat and when Parker re-joins it will be the perfect tonic for down the season stretch. The message is more of the same. Only this time you sense a happy ending is getting closer than ever. 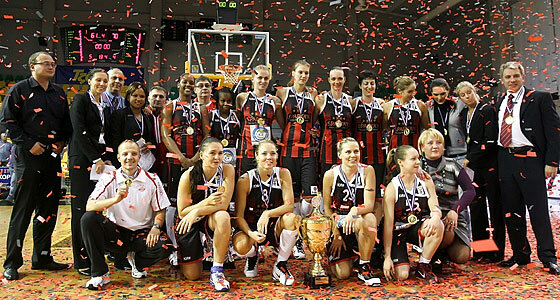 EuroLeague Women 2010 - Finished 1st in Group A (9-1) and made it to Final Four but lost 87-79 to arch rivals Spartak. Domestic League 2010 - Second place during regular season but made amends with 3-0 sweep of Spartak to be crowned Russian Champions. The Gap To Fill - Are you kidding me, a gap on this star studded roster? Even Candace Parker has been (temporarily) replaced by the classy Crystal Langhorne! Star Choice - Take a pin, close your eyes and stick it pretty much anywhere down the list of players if you want to find a star on this team. If I have to choose, which is the case, then I am going to say Agnieszka Bibrzycka. ‘Biba' was immense last year just because of her all round consistency in each facet of her game. She shot the ball well from outside (over 43 percent), did the dirty work in the paint with over 4 rebounds per game and showcased her all round skills with 3 assists and 2 steals. The Polish star turns 28 later this week and is really in her prime right now. The best of a brilliant bunch and even then, we are splitting hairs! Rising Star - There are no real rising stars on a roster pretty much packed with established world stars from top to bottom. Did You Know? - UMMC Ekaterinburg have finished in third place for three consecutive EuroLeague Women campaigns. "Group B is very strong. Gospic is new to me but you should never underestimate a group of young talented players. Playing in Sopron is always a challenge. They have their crowd as their strong 6th man. They also show their ambition by signing McCoughtry. Lotos Gdynia have been playing in EuroLeague Women for many years and they always have a solid team. Rivas Ecopolis have signed Amaya Valdemoro and Elisa Aguilar. "They will bring the Spanish fire to the court in Madrid. Fenerbahce have a new coach and basically a new roster. Coach Ratgeber and names like, Matovic, Vajda, Horakova and last but not least, Diana Taurasi. Knowing that they have strong Turkish players and Penny Taylor from last year, this team is a Final Four candidate for sure! As for Ekaterinburg, we are ambitious as ever! We have kept the same roster as last year. I think it is always good to work with the same team. We will do everything we can to bring that first EuroLeague Women title to Ekaterinburg. Crystal Langhorne has joined the team and Candace Parker will be back in January." clubs gave European fans something to savor. Sparta&K - again finished on top, winning 70-61. Monday's contest had an All-Star Game type of feel. The silky smooth Sparta&K star Noelle Quinn's 18 points led all scorers. taken some giant steps forward the past couple of years. for the very first time. Some of those players followed up that wonderful achievement with an incredible run in Greece with Athinaikos. They went undefeated in the Greek league, won the domestic cup and also captured the EuroCup Women title. In the first week of October, Greece played in their last games at the World Championship in the Czech Republic. Dimitra Kalentzou was among them. On Monday inside the Maroussi arena, Kalentzou was at it again. Her three-pointer with 6:46 to go in the second quarter cut Sparta&K's advantage to 22-21. Almost on cue, as Ilona Korstin has done so many times before, she ignited a game-winning 12-0 run with a three-point play. deficit to just 61-55 with 5:39 to play. Quinn's jump shot and two free-throws by Korstin stopped the rally, though, and the visitors held on for the win. The fans got what they wanted and that was an entertaining 40 minutes. Jekabsone-Zogota chipped in with 10 for the winners. This is 1st week from Turkish League yes? Fenerbahce lost because Taurasi didn't play. Yes, this is the 1st league of Turkish League.. Taurasi played about 32 minutes but she didn't score..Panküp is a good team, they have very good players from WNBA..Panküp's players defenced her very good so she didn't score! That was just a bad day for the team, a couple of days ago we won a cup called Presidental Cup against GS with high difference, but Taurasi didn't show any prospect on that game either, its just she needs some time to fit the team more.. This season's first match in Women Euroleague! Edited 2 times, last by kadir_8 ( Oct 27th 2010 ). Wooww!! What a match VICI Aistes won the match with last ball!! 81-79 !! VICI Aistes 81-79 Spartak Moscow Region !